This multitalented impressionist embodies some of the most famous women in history in her unique and value-packed show. 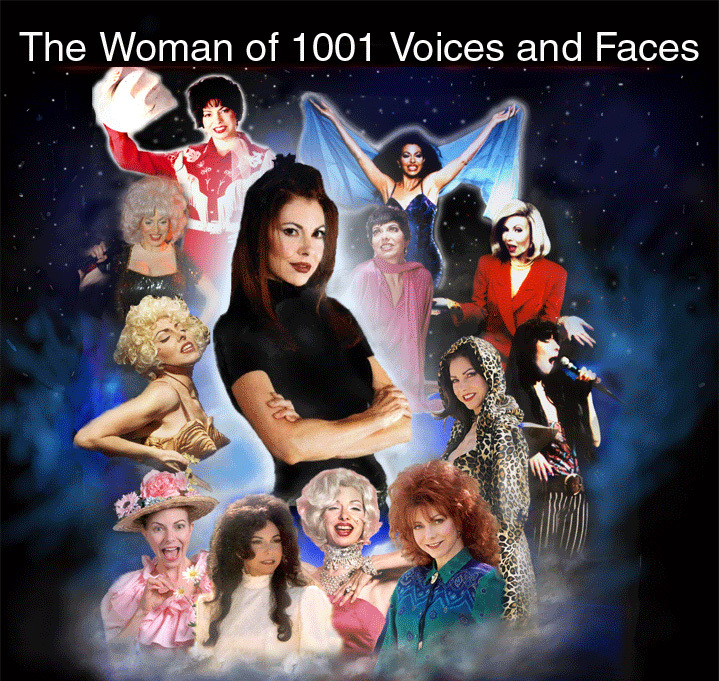 She uncannily captures the voice, look, and mannerisms of some of the biggest female stars from the world of music, film, television, and comedy. The incredibly talented star makes dozens of costume changes over the course of her intimate 60 or 90 minute show as she embodies classic and contemporary musical icons such as Cher, Madonna, Tina Turner, Shania Twain, Dolly Parton, Reba McEntire, Patsy Cline, Ella Fitzgerald, and, screen legends like Liza Minnelli, Barbra Streisand, Judy Garland, Marilyn Monroe, hilarious comediennes like Joan Rivers and Minnie Pearl and countless others. It's not that just that she perfectly mimics the voices of the famous ladies she impersonates… she becomes them, taking on their mannerisms and body language, wearing the costumes that made them famous, and recreating the special charisma that made them iconic stars in the first place. Your jaw will be on the floor as you witness one woman effortlessly step into the roles of dozens of your favorite contemporary and classic female stars.She is also known by her peers as the hardest working woman on stage by combining her singing, dancing, and comedic chops into one exciting show like no other. An intimate tribute show experience in which one extremely talented performer stunningly embodies some of the greatest female stars from the world of music, film, television, and comedy. Her impressions are so vivid and true to their sources that you'll swear you're witnessing all of the real icons on stage in a loving yet hilarious homage to some of the most famous ladies of all time.